Free art classes and workshops, talks and tours, bring alive to visitors the varied works of art contained in the 25 galleries of the Wallace Collection, on display in Hertford House - an historic London town house and the original family home of The Marquesses of Hertford and Sir Richard Wallace. Deemed "the greatest art school in this country" by Vivienne Westwood, the collection is full of European paintings, miniatures and sculpture, French 18th century furniture, Sevres and Meissen porcelain, goldsmiths' work and Oriental and European arms and armour. It's one of the finest collections of art amassed by one family. Sir Richard Wallace - the illegitimate son of the 4th Marquess of Hertford - built up the original collection left to him by his father. Several Old Master paintings, notably 'The Laughing Cavalier', works by Rembrandt, Van Dyck, Reynolds, Rubens, Gainsborough, Titian and Romney make this gallery a worthy rival of others in the city. Renovations to the town house, which uniquely occupies the whole side of a garden square, include four galleries, educational facilities and a stunning glass-roofed courtyard - home to Oliver Peyton's brasserie The Wallace. The acquisitions, bequeathed to the nation by Wallace's widow in 1897, are all free to view. For more information please visit www.wallacecollection.org. 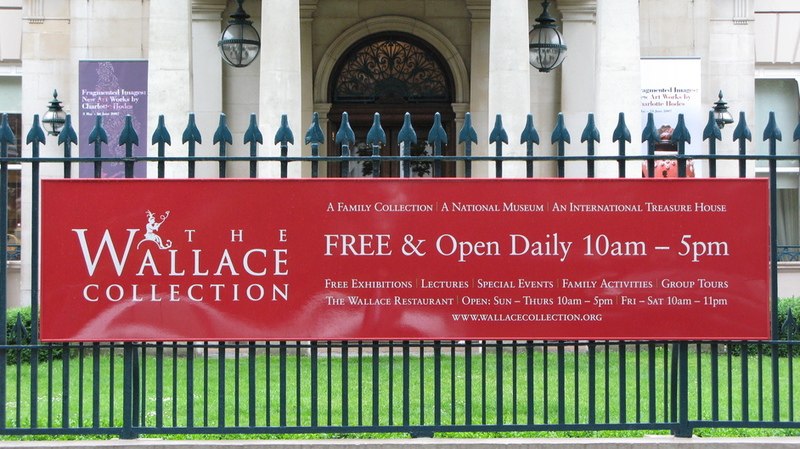 What are the best dining options near Wallace Collection London? Wallace Collection gyms, sporting activities, health & beauty and fitness. The best pubs near London Wallace Collection. Wallace Collection clubs, bars, cabaret nights, casinos and interesting nightlife. Where to have your meeting, conference, exhibition, private dining or training course near Wallace Collection. From cheap budget hotels to luxury 5 star hotels see our discounts for Wallace Collection hotels, including Mandeville Hotel London from 85% off.